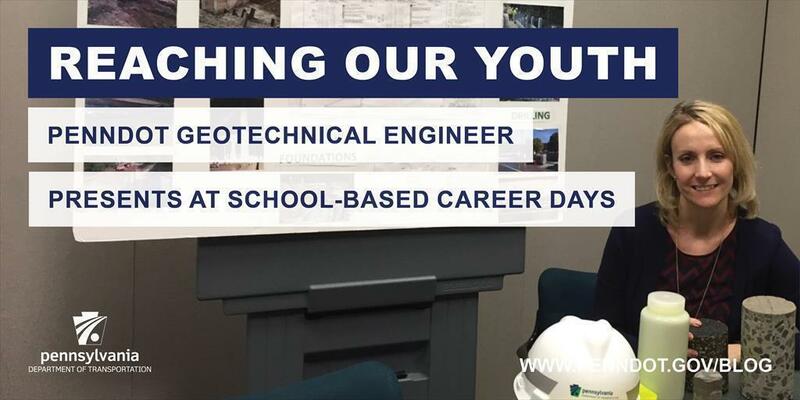 Alicia Kavulic, a geotechnical engineer with PennDOT's Indiana-based district, has been presenting at school-based career days in Indiana and Armstrong counties for many years. Recently, she presented to sixth-graders at the Saving Grace Church Homeschool in Indiana County. Kavulic uses simple questions to reinforce the principle that everyone is affected every day by civil engineering. She then turns their focus to transportation and PennDOT. Her "show and tell" presentation exposes students to materials used in transportation activities. She passes around bituminous and concrete core samples, explaining their make-up and use in paving operations. The students handle rebar, geotextile, rock cores, and glass beads, followed by a discussion about usage. "Students are always amazed that the tiny glass beads can make paint lines reflective," Kavulic explains. She also shows the students photos of construction projects and explains how roads and bridges are built. Along with the career details, Kavulic emphasizes safety — she dresses a student in a hard hat and vest and talks about work zone safety. She also talks about pedestrian safety, especially safely crossing at crosswalks. Over the years, she has attended Career Day at Homer Center, Blairsville, Kittanning, United and Apollo-Ridge. She has spoken at Apollo-Ridge — the school her children attend — annually for the last six years. Kavulic likes visiting these local schools, especially United. "United was very special, because that is where I went," she says. "I was happy to see my sixth-grade homeroom teacher when I presented there last year!" Kavulic enjoys participating in Career Day. "It's fun to talk to the students and explain the interesting projects we do here at PennDOT," she says. "One of my favorite parts is when I receive thank-you notes from the students. They draw pictures of bridges, cranes, trucks, etc. on them and I have saved them all!" If your school or organization is interested in having a PennDOT employee speak, contact your local district and ask for the communications office.